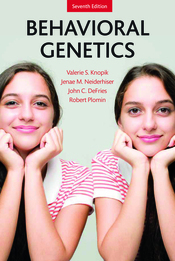 With its clear and concise presentation, Behavioral Genetics, 7th edition introduces students to the field’s underlying principles, defining experiments, ongoing controversies, and most recent discoveries. The text provides students with an understanding of heredity, it’s DNA basis, the methods used to discover genetic influence on behavior and identify specific genes. It then examines what is known about genetic influence on cognitive ability, psychopathology, substance abuse, personality, health psychology, and aging. Finally it looks ate the future of the field of Behavioral Genetics and area where some of the most exciting development in the Behavioral sciences are being made.